Local whale watching company in Dalvik has been very pleased these days and proud to announce every day departures starting at 9am in the morning. There have been lots of whales to be seen in the fjord lately,especially many humpback whales. 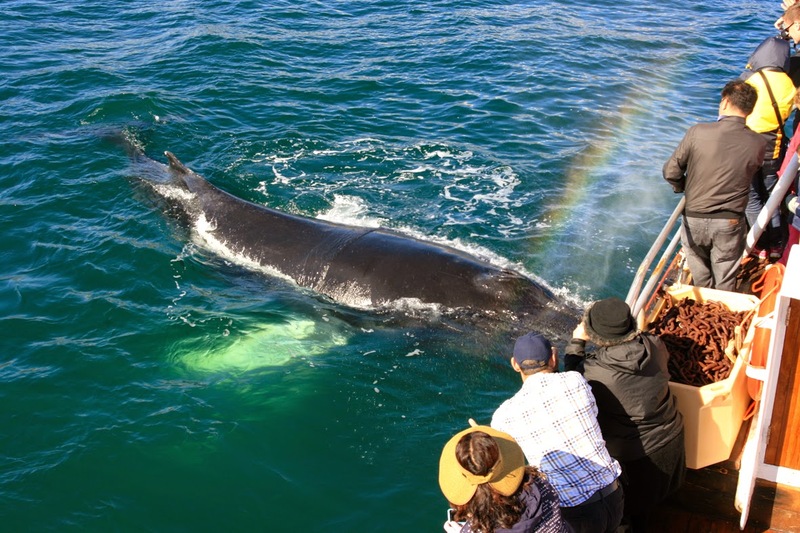 Recently, they spotted up to 6 humpback whales in one of the tours, dolphins & porpoises! And, this is just a reminder that if you book via our GO LOCAL ICELAND initiative, you get 15% discount. This offer is valid all-year round. Well hidden treasure in Hjalteyri is a hot pot located by the sea shore. This small village is located in a very special bay with very deep waters - apparently a favourite spot for whales. On top of this, there´s a diving center that can help you explore the sea bed with its unique and only geothermal cone found in the world you can scuba dive to. And last but not least - fresh news about more cheap flights to Iceland via www.norwegian.com. They will fly to this island not only in the summer time but the schedule is planned even for January 2015. Just bear in mind that they don´t fly every day. Those wanting to come from Prague - you might want to check the connections that www.norwegian.com operates between Prague and Oslo. Since we´re especially connected to both, Slovakia and Czech Republic, here comes an inspiring post to help you get oriented within some options of getting to Iceland cheaply in the summer of 2014. It is really important that you answer a few questions for yourself when deciding what services to invest in. The thing is, that nowadays you can get really cheaply to various places in the world (including Iceland), by combining air-tickets from various low costs companies. However, there´s a big difference in terms of risk that you´re taking, when you have your e.g. 1 stop combination bought in 1 air-ticket or whether you end up buying 2 separate tickets. If there´s a delay, only the combination bought on 1 ticket guarantees less hassle and no extra costs (depending on the conditions of the tariff that you ended up buying). So, if you want it really really cheaply and decide to risk, you always have to bear in mind consequences when things don´t go as planned. Another question to answer is: What is cheaply for me, or in other words, what is the maximum I´m ready to pay and what comfort do I want for what I´m willing to pay? I´d say that it is still very reasonable to pay around 400 EUR for a return between ex-Czechoslovakia and Iceland, in the high season. Although prices can range from 300 EUR all the way up to 600 EUR for one person and a return. Well, there´re no direct flights between the above mentioned countries and Iceland, announced for the summer of 2014, but you have great options from BERLIN, VIENNA or MUNICH, presuming that you don´t mind getting cheaply (train or bus) to any of these 3 cities. Now, remember that the prices include different services and also offer different comfort, not to mention the options for changing the ticket. So we definitely encourage you to check the details of the tariff you decide to buy really well. 2, Combinations with 1 STOP. London (Luton) could be a place to change, as EASY JET offers directs to Keflavik this summer. For more info on this click here. Brussels could be another place as Thomas Cook started off some nice offers this year. For more info click here. Oslo. Yes, believe it or not, national carrier of Iceland: icelandair.is charges very low for flights between Oslo and Iceland. If you´re able to get to Oslo really cheaply and are able to find good time combinations, then definitely have a go! and that´s it for a start. Go ahead, start playing with it and let us know in case you find some new and fresh combinations so that we can share it with others for the summer of 2014. 15.6. - 26.6.2014. More info here and details about his work here. I came across very special candles the other day, when in Reykjavik and could not do otherwise but buy them. They were hand-made in Iceland, and the ingredients used were: soya wax, rowan berries, 2000 years old lava stones and Icelandic moss. The scent is charming and calming and I loved them so much that I decided to contact the producer directly and order quite some pieces so that I have enough as presents for my close ones. Since there´s no retail currently with these products in Akureyri, I find it important to share the details so that you can either order it, or simply stop by in Húsavík and get them there, if this is something of your taste. And last but not least, they´ve been busy creating all kinds of great stuff, not only candles, so those interested, check out their offer in the catalogue here. Hm, one more hidden hand-made treasure to share. A friend of mine took me to Hjalteyri the other day. Tiny village with a huge old abandoned fish factory which has turned into rough cultural spot. In the building in front of the factory, there is a great artist Lene who has been creating breathtaking products made of mostly animals´ skin and hair (spreads, necklaces, bracelets, pouches, bags, ...you name it). BUT, it´s really not easy to find, as there´s no sign on the door. So, just knock on the blue door and ask for Lene and enjoy her unique kingdom with unique souvenirs. While in Hjalteyri, I was introduced to a secret place, so stay tuned and check out the BLOG soon, as I´ll reveal more details about this in the next article.